Almost immediately after it came out, we found ourselves sucked into the immersive and mostly flattened world that makes up The Silent Age. Stylish and straightforward, this free episodic story-based game with a time travel twist delivers a surprisingly addictive plot. The nostalgic element of the game has everything to do with its setting. It's 1972 and change is in the air. This weighs both figuratively and literally on a janitor named Joe, a hypothetical everyman with a mustache who is handed a portable time travel device. It shifts between two times: his present and some well-weathered point in the near future after civilization came to a reasonably abrupt stopped. Playing in two times gives the game legs. Although the puzzle of the game is relatively simple and surprisingly linear, forcing Joe to find and use various tools in a linear cluster (e.g., you can't find a tool in a room that hasn't been unlocked by a key someplace else), the writing and design saves this gem from obscurity. It's creative. And that counts. There is an unquestionable enjoyment in discovery. For example, a random plant in 1972 grows to block a door in the desolate setting of 2012. The man you passed on a table is reduced to dust and bones, exactly the way he was left for dead a long ago (or in the very near future). So it's all up to Joe to navigate this crazy obstacle course with near average intelligence (or slightly brighter depending on you). The trick is, of course, to toggle between times and use each to its advantage. A plant, for example, killed four decades ago won't ever grow to wild proportions and block a door. A locked door can't slow anyone down if the walls have collapsed around it. An orange jumpsuit worn by a time traveler remains suspiciously nondescript, mostly to remind Joe (and you) that the fate of humankind has fallen to a chronic underachiever who wasn't even given more clearance until his predecessor met his demise. The Silent Age falls somewhere between campy and spooky. While it might be more fun to have even more interaction in the environment, the game developers seemed to have kept the game play straightforward on purpose. Rarely will anyone become stumped at the successively and lightly progressive challenges that keep getting thrown in Joe's way. The benefit in keeping it simple is that The Silent Age pace remains largely seamless for the story. Joe never knows exactly what is happening but always has a sense of what needs to happen next. This creates a compulsion to play through with curiosity and will make some people crazy because episode two is not complete. In order to make the game a labor of love fueled by passion instead of cash, the game developers are asking for donations of $25,000 to complete episode two. Once they do, those who helped out will get the game for free. Everyone else will have the option to buy. Think of it as reverse crowdsourcing as the developers want to reach a no-risk threshold before they give up the goods (which are, at least, party done). A few words about the indie developers who designed it. 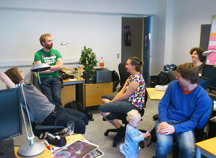 The game was created by an indie developer based in Copenhagen. It mostly consists of a team of six, with programmer Linda Randazzo, game designer Thomas Ryder, and production manager Uni Dahl (who also programs from time to time). They originally came together to create a different game, Neon Zone, but then became immersed into this alternative universe instead. Episode two, they say, will also be the final installment. The development team wants to keep the game straightforward without too many extensions. Some players might have feelings about the news, given the expressionless Joe has a significant amount of character. Maybe it's the mustache, originally meant as a Facebook joke for the Movember Moment until fans picked it over a clean shaven hero. 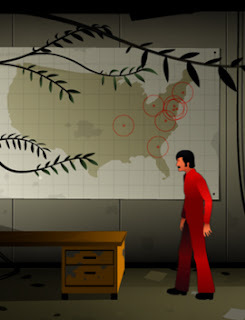 The Silent Age Shakes Up Time At 7.2 On The Liquid Hip Richter Scale. If the puzzles weren't so easy and the linear controls not so confining, possibly even alternating outcomes like The Walking Dead, the game would score even higher. But even as it stands, The Silent Age with its stylish throwback graphics and clever storyline is well worth the the investment. It's especially promising as something opens up Pandora's box for more time travel games in the future (or maybe the past). The Silent Age is currently available from iTunes for iOS devices such as the iPhone and iPad. However, plans are in the works to release the game for the Android too. The company, House On Fire, is very adept at communication through its social media channels. Visit them on Facebook.